One of the pens on my “holy grail” list was a Nakaya in the Ishime-Kanshitsu Midori finish. I finally purchased one in June 2018 from Nibs.com and chose the Nakaya Portable Cigar model. I can honestly say this is one of the most beautiful pens I own. Ishime-Kanshitsu is a special process that creates a stone-like texture on an ebonite pen. “Ishi” means “stone” in Japanese and “Kanshitsu” is the layering process. Creating an Ishime-Kanshitsu surface takes three months. 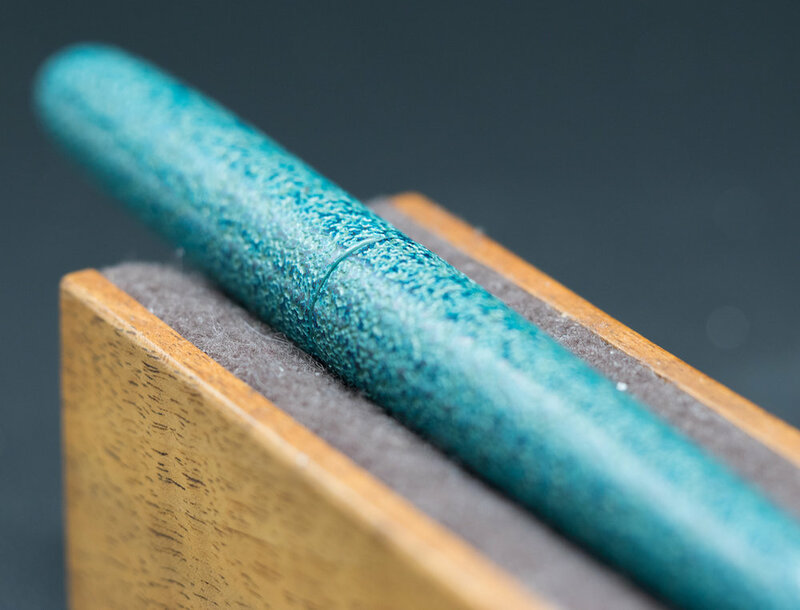 Urushi powder is sprinkled on the body of the pen to create the texture. Charcoal is rubbed over the surface to sharpen the Urushi grains. Then, layers of lacquer are applied to harden the body. Finally, a silver lacquer is applied (Source: Nibs.com). The results are extraordinary--just look at the various colors and details in the picture below. Obviously, this time-intensive process creates a writing instrument that is also a work of art. The Ishime-Kanshitsu texture feels wonderful on one’s fingers and it is extraordinarily beautiful in person. I chose the Nakaya Portable Cigar model because I didn’t have another Nakaya in this model and because the simple cigar shape shows off the textured surface well. This is a large pen (5.9 inches/150mm capped, which is just a tiny bit longer than a Montblanc 149, and 5.1 inches/130mm uncapped), but the ebonite and Urushi composition means that it weighs very little. This pen is not meant to be posted. I chose a 14K medium-soft Nakaya nib and had it modified by John Mottishaw into an elastic nib. An elastic nib is different from a flex nib. It is a very soft nib with special cut outs that allow the nib to curve up from the feed like a paintbrush on paper (see the photos below). The tines don’t really separate much, but you can get a bit of line variation with this nib. I enjoy writing with this nib more than any other nib I own. 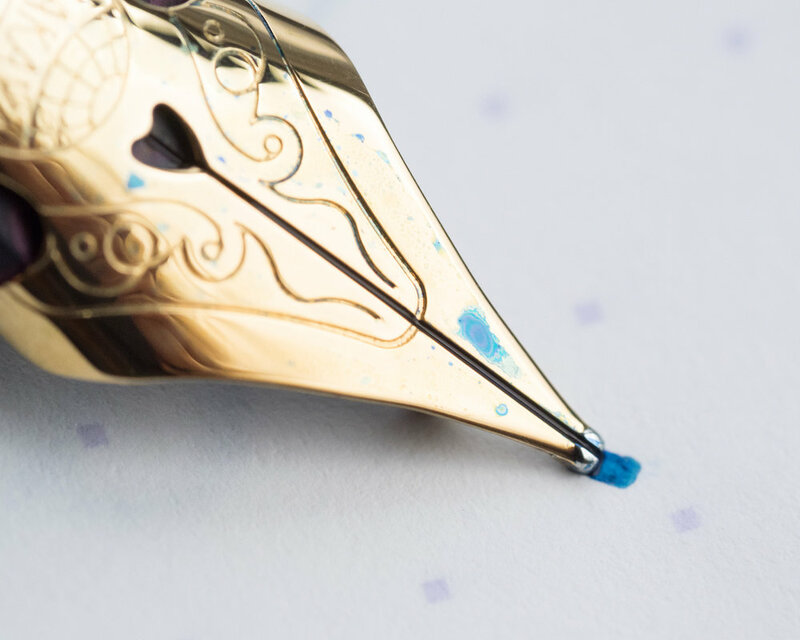 It is remarkably smooth, and writing each letter is like painting a tiny picture. Writing with an elastic nib is a soothing experience because you must write more slowly since you are essentially painting words. It’s unlike any other nib I’ve ever used, and it’s very zen-like. That said, I initially had some difficulties with my nib. It seemed starved for ink. Writing (even with my preferred Iroshizuku inks) felt dry, and I encountered lots of hard starts and skipping. I sent the pen back to nibs.com and they worked some magic on the feed and the nib. When it came back, the nib wrote much better. It produces a lovely, wet line and it no longer skips. I do still experience some hard starts on down strokes, but overall the nib functions quite well. One of the main weaknesses of any Nakaya pen is the converter (it is the same as the Platinum converter). I don’t know why Nakaya insists on this tiny converter that works properly only when it’s mostly full. Once you use half the ink, a huge bubble develops in the converter and you have to manually push the ink down to continue writing. They could, at least, insert a ball into the converter to prevent this from happening (in fact, I’m thinking about doing this myself using a ball from an unused cartridge I own). What would be better is if they would create a superior converter. I’m quite happy with my Nakaya Ishime-Kanshitsu Midori pen. I love the texture, shape, balance, and nib on this pen. It is simply a joy to use. Of course, such beauty comes with a steep price. I paid $1,280 for this model with an elastic nib. As always, the question of whether or not a pen is “worth it” is dependent upon the person who uses the pen. I feel this pen is worth every penny because of its unparalleled beauty and because the elastic nib is so wonderful to write with (now that it’s been properly adjusted). Here are a few more pictures of this beauty for you to enjoy. I must say, it is one of my most photogenic pens! Posted on January 4, 2019 by Susan Pigott and filed under Nakaya, Fountain Pens, Pen Reviews. My favorite creature on earth, next to kitties, is the dragonfly. Every summer I go on yard safaris, taking photographs of the insects that inhabit our yard. When I find a dragonfly, I feel like I have discovered gold. Nothing makes me happier than capturing dragonflies on camera. Dragonflies are sky lions–carnivores who zip through the air like gravity doesn't matter. Not only are they incredibly beautiful, but they rid the air of pests. I adore dragonflies, so when I saw that Classic Fountain Pens (nibs.com) had a Nakaya Portable Cigar Spiketails (Dragonfly) fountain pen in the preowned section, I went nuts. At $1,300 (used–yes, used), this was not a pen I could just buy outright. I knew I would have to part with some amazing pens in order to afford the Nakaya. I chose to sacrifice two pens to buy my grail: an uninked Montblanc Oscar Wilde and an Omas Paragon Arco (old style). Parting with the Oscar Wilde wasn't too hard since I had never inked the pen and I hadn't bonded with it. The Paragon was more difficult. It's such a unique and beautiful pen and I loved the nib. But, at the time, Omas hadn't gone out of business and I wasn't too attached to the Arco. Silly me. So, I posted both pens on the classifieds at Fountain Pen Network and Fountain Pen Geeks and crossed my fingers. It took about a month to sell both pens (and I had to do several price reductions), but eventually I had enough money to buy the Dragonfly with a nib grind to boot. What makes the Nakaya Spiketails so unique is that it is a hand-painted acrylic fountain pen. Unlike most Nakaya pens which are completely opaque, the Dragonfly is partially transparent with raised painted designs covered in semi-transparent red (Shu) Urushi lacquer. The dragonfly wings and some of the swamp grasses are coated in gold dust and semi-transparent Urushi. In sunlight, the effect is absolutely magical. The dragonfly design is genius, with the dragonfly's body curving gracefully along the pen and its wings encircling the cap. The dragonfly is amazingly detailed. The bottom of the pen portrays the swamp grasses that are the habitat of the dragonfly. My pen came with a BB single-tone 14K nib. I had nibs.com grind the nib down to a medium italic. It writes beautifully, though I will say this isn't the smoothest nib I've received from them. I could send it back for more work, but I'm afraid this is one pen I just can't let out of my sight. I realize some people don't understand grail pens, especially ones this expensive. "Why would you ever spend that much money on a pen?" I can't offer a reasonable explanation, because grail pens aren't reasonable. A grail pen is a pen you desire because it means something special to you. You can't justify this with logic. Ultimately, the reason one buys any grail pen is intensely personal. For me, a pen representing one of my favorite creatures on earth is meaningful to me. Also, this isn't just a pen I write with, it is a piece of exquisite art. Posted on April 29, 2016 by Susan Pigott and filed under Fountain Pens, Nakaya, Pen Reviews. I haven’t been a fountain pen user for very long, but the good fortune of having a little bit of disposable income to put towards my pen addiction has allowed me to explore a broad range of pens at a number of price points. When I first decided I wanted a fountain pen, I had the same reaction most people do; “I can’t believe I’m seriously thinking about dropping nearly thirty dollars on a Lamy Safari!” But I fairly quickly passed through several price barriers – fifty dollars (Monteverde Intima), a hundred dollars (Pelikan M205), one hundred and fifty dollars (Pilot Custom 74). My sensitivity to price was decreasing at a rate proportional to the enjoyment I was getting out of my new hobby. Then I heard about Nakaya. The priciest pens I had seen up to that point – the Montblancs, Viscontis, Auroras – they held little appeal. At least not at their (in my opinion) inflated price points. But when I saw a Nakaya for the first time on The Pen Addict, that voice in my head, my two-hundred dollar conscience? He didn’t have a chance. They were SO BEAUTIFUL. And everyone in the pen community who owned one RAVED about their Nakaya. I tried to explain how it wasn’t just a pen, it was a capital-P PEN. Number one on a short list of grail pens. I could tell I wasn’t getting through. I talked about the art of urushi lacquer and its roots in ancient Japan. I tried to explain how a perfectly balanced pen becomes an extension of one’s hand. I attempted to describe what it was to write with a perfect nib, strong but soft, smooth but responsive. Her expression was a mixture of bemusement and befuddlement. She clearly thought I was in the grip of some terrible fever, and I knew most of my homily was lost on her. She also saw my eyes were shining and my excitement was real. One of Dana’s many qualities is her willingness to indulge some of my obsessions. Then she asked how much a Nakaya would cost. I told her. What she said instead was, “There are way too many choices here. Just tell me which one you want.” Some of you, at this point, will be wondering what the problem is. I’d been given carte blanche to select my grail pen. I had full freedom to choose exactly what I wanted! The proverbial green light! Why was this a problem? The problem was I didn’t know exactly what I wanted. And what was more, I didn’t WANT to choose. While I was researching Nakayas, I tortured myself trying to decide which one would be “perfect.” I read reviews, asked Nakaya owners for opinions, and lamented the fact that I couldn’t get to Los Angeles to the pen show to take a test drive. I stayed in this analysis paralysis for months. So the idea of picking one, just one, to the exclusion of all others, was daunting. So I took the middle road and gave her some parameters. I showed her the models I was interested in; the Portable Writer, the Dorsal Fin, and the Piccolo. I told her my favorite colors; brown-green, blue-green, red over black, and black over red. I did specify that I wanted a medium nib. So I had given her a dozen options. Three models, four colors, zero idea of which one she would choose. I was never nervous. I never imagined, even for a moment, that I wouldn’t be happy with the pen she picked. Despite not knowing, I knew. 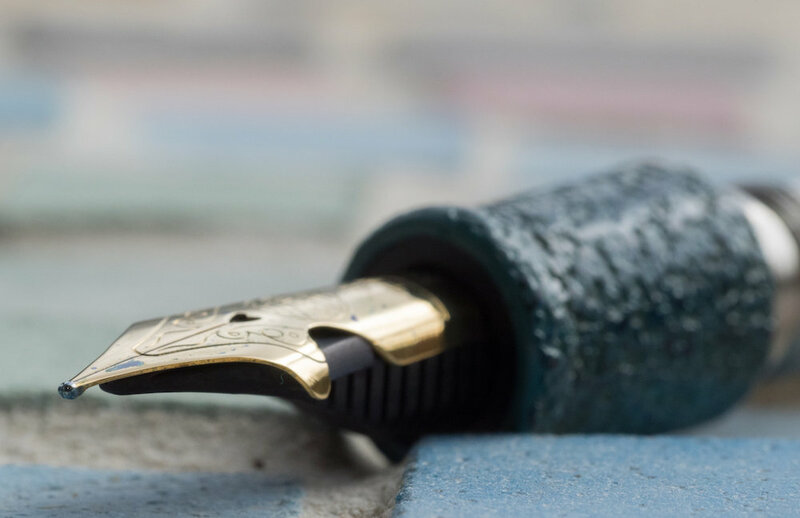 First, I knew that one of the best things about fountain pens and fine writing as a hobby is the infinite number of new experiences available to the open-minded. There are innumerable combinations of pen, ink, paper and nib, and no one can predict which will delight a given individual. So I allowed myself to be open to the idea that no matter which Nakaya I got, it would be a great experience. Second, and more importantly, by putting the final decision about my grail pen in the hands of my wife, I would be getting a gift given with thought and given in love. I was trusting her with a (relatively speaking) important decision about a thing that was squarely in my world, not hers. I believed and trusted that she knew me, and by accepting the responsibility of choosing, she conveyed to me that she cherished that trust. At that moment, sitting together in our living room in our favorite chairs, comfortable and happy together, I became certain that there could be no wrong choice. She couldn’t possibly choose the wrong pen, because any pen she chose would always be the pen she chose for me. I knew I would love the pen because I love her, and because she loves me. And when I unwrapped my new Dorsal Fin in Aka-Tamenuri on Christmas morning, I loved it. We pen people are a little weird, a little off center. We can get a little crazy about pursuing THAT PEN. Letting someone else choose that precious possession may not be something everyone can do. It requires a willingness to let go that certainly didn’t come easy for me. For some, it may be impossible. For me, giving up that little bit of control made the Nakaya immediately and forever my favorite pen. Not just because it’s awesome (it is) but because it was always remind me of that Christmas, and of my wife and best friend who got it for me. Posted on March 24, 2015 by Brad Dowdy and filed under Nakaya.